Telling Their Story: A Readers’ Celebration of Rose Under Fire! 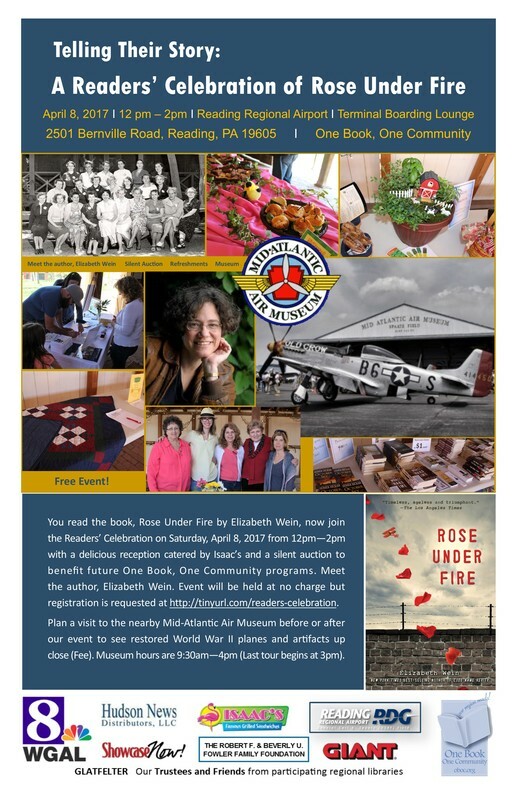 You read the book, Rose Under Fire by Elizabeth Wein, now you are invited to join the Readers’ Celebration that will be held on Saturday, April 8 from 12:00 – 2:00 pm at the Reading Municipal Airport at 2501 Bernville Road, Reading, PA 19605. This free event will celebrate the reading of this year’s One Book selection with a special appearance of the author! World War II displays, a slide show, music from the era in which the book is set, and refreshments all add up to an afternoon of fun and enjoyment for the public. This year’s OBOC regional campaign represents collaboration between 80 libraries in six counties: Berks, Dauphin, Lancaster, Lebanon, Perry and York. Reading campaign organizers encourage residents of the six-county region to read the book and attend programs during 2017.